In a previous post I showed the temperature cycle on the Antarctic Peninsula, and pointed out that the monthly mean atmospheric temperatures show that it is actually surprisingly moderate. Whether you consider the temperature cycle moderate or not, the cold temperatures and strong winds drive an amazing amount of seasonal sea ice production. This plot shows the average seasonal cycle of Antarctic sea ice extent against date. 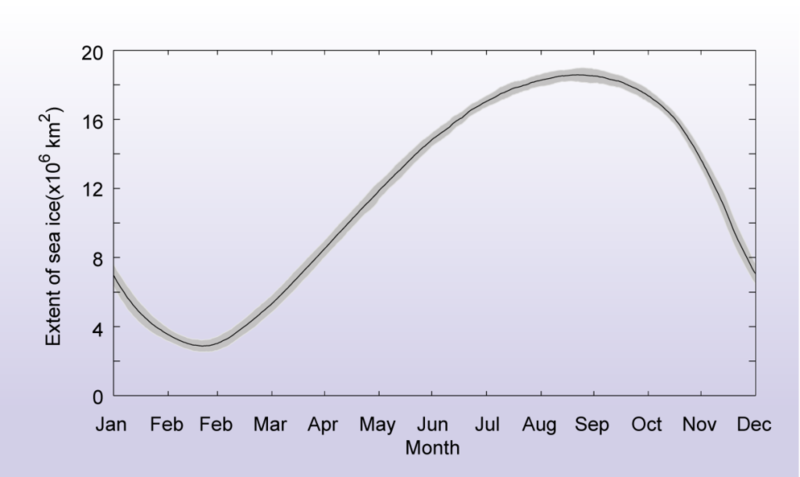 The daily average extent is calculated from the satellite record from 1981-2010, and the grey shading either side of the line is the standard deviation. Here are three obvious things to pick out of this plot. Antarctic Sea Ice extent varies a lot: From 2.9x106 km2 in February to 18.6 x106 km2 in September. This is a range of 15.7 x106 km2. I showed that the area of Antarctica is much bigger than the area of Europe. Given that the area of Antarctica is ~14 x106 km2, you can see that when the sea ice is at a maximum the area of ice in the Southern Hemisphere more than doubles. The seasonal cycle is not symmetrical: There is a slow growth followed by a relatively rapid decay. To really get an idea of what this asymmetric growth / decay pattern looks like watch the following you tube clip a few times. (The data for the movie is from the AMSR-E Satellite and it is from Climate Central. So slow growth, and then rapid retreat. Ice tends to advance away from the continent, but as it retreats it can melt first within south of what you would consider the ice edge. How the Antarctic sea ice extent is changing is for a future post, but it is currently increasing. There are significant regional changes over the duration of our satellite record. For a couple of good accesible comments on the trends in Antarctic sea extent you could read Professor John Turner in the Guardian, or Tamino on the Antarctic Sea Ice increase. The average sea ice extent is part of the National Snow and Ice Data Center (NSIDC) Sea Ice Index. Fetterer, F., K. Knowles, W. Meier, and M. Savoie. 2002, updated daily. Sea Ice Index. Daily Sea Ice Extent Climatology. Boulder, Colorado USA: National Snow and Ice Data Center. http://dx.doi.org/10.7265/N5QJ7F7W. The actual file I used is downloadable from this FTP location. Posted in Science. Tags: Antarctic Peninsula, antarctica, sea ice on February 4, 2014 by Mark Brandon.